All pricing below is plus HST, and excludes parts unless indicated. If your regulator is under manufacturer warranty, parts may be free as long as the regulator is being serviced within the period specified by the manfaucturer (normally every 12 months). Service will include a complete disassembly, sonic cleaning of all metal parts, replacing or inspection and cleaning of all internal components, lubing, and re-assembling the regulators, After the service, your regulator will be fine tuned and adjusted to specs on our flow bench. SCUBA cylinders must be looked after and well maintained to ensure a long life. Annual visual inspections by qualified professionals, ensure your tanks continue to meet industry standards. Hydrostatic testing is mandatory and must be completed every 5 years. Please remove valve caps, tank netting and boots prior to bringing in for service. COJO Diving will not be responsible for parts left on tanks delivered for service. NOTE: ALL ALUMINUM TANKS MANUFACTURED PRIOR TO 1991 REQUIRE A MANDATORY VIS PLUS AT TIME OF TANK HYDRO. THIS ADDITIONAL FEE IS APPROXIMATELY $30+HST. Unforseen additional service may be required and additional fees may not be known until after the service has started. You will have the option to not have the work performed and all possible old parts will be re-installed. You will still be liable for the labour incurred at the standard shop hourly rate. 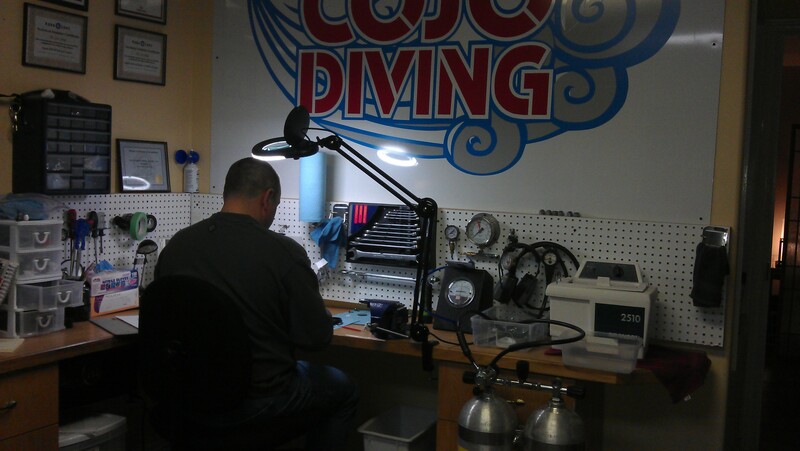 Note: All equipment left at COJO Diving over one month after servicing is complete will be given a storage fee. Equipment abandoned after 12 months will become the property of COJO Diving.